Callisto is the second largest moon in the Jupiter system and is nearly the size of Mercury. It is the most distant of the Galilean moons from Jupiter. It was discovered in 1610 by Galileo Galilei and independently observed by Simon Marius. Callisto a half-rocky, half-icy world. Its surface contains water ice, carbon dioxide ice, silicate dust and rock particles, and hydrocarbon compounds. No activity has been detected inside Callisto, and most of its surface features appear to be created as a result of multiple impacts, rather than tectonic activity. It does not appear to have been tidally heated. 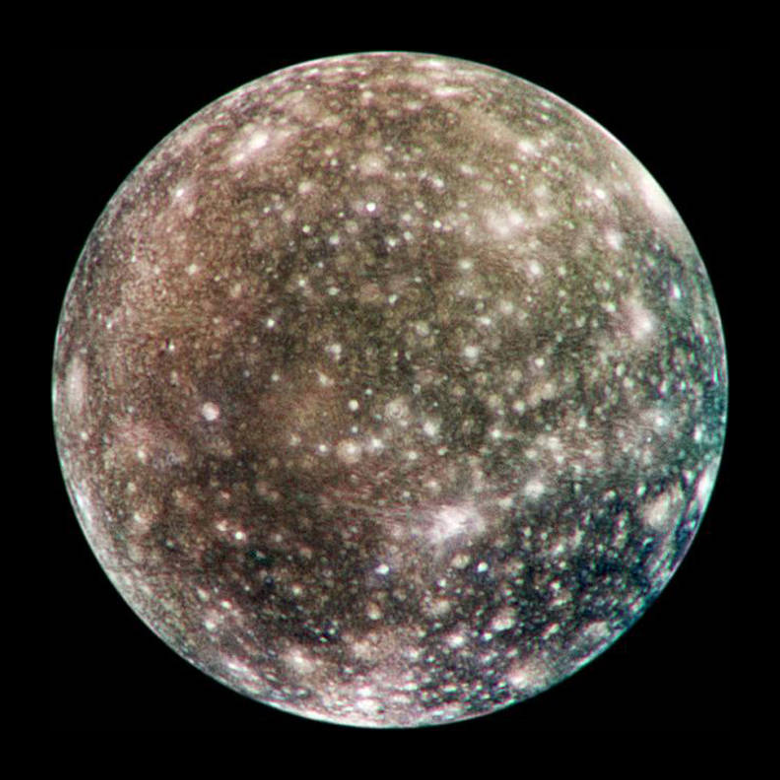 Callisto has the most heavily cratered surface of any world in the solar system. There are so many craters than a new impactor would obliterate an older one. The most prominent feature on Callisto is a multi-ringed impact basin called Valhalla. It stretches across more than 1,800 kilometers and was created during a giant impact event some 2 to 4 billion years ago. Callisto is a layered world, with a rigid outer surface and an interior ocean likely made of water mixed with salts or ammonia. There is a thin atmosphere at Callisto made mostly of carbon dioxide. It was detected by the Galileo spacecraft. Callisto has been explored by the Pioneer, Voyager, Galileo, Cassini and New Horizons missions. They all studied its surface, looked for atmospheres or magnetic field changes, and in the case of Galileo, mapped the surface at high resolution. NASA once studied Callisto as a possible place to send human expeditions as a base for further exploration of the Jovian system. This mission might fly in the 2040 time frame.